Truncate living stone is a clump-forming, evergreen succulent perennial plant. It has paired pale buff leaves veined and mottled with olive-brown on the tips. The flowers are bright yellow in color and open during the late summer and autumn. The flowers are fleshy and around 4cm in size open in late summer and autumn. Seed capsules mostly 6-chambered. Seeds are Light brown to brown. 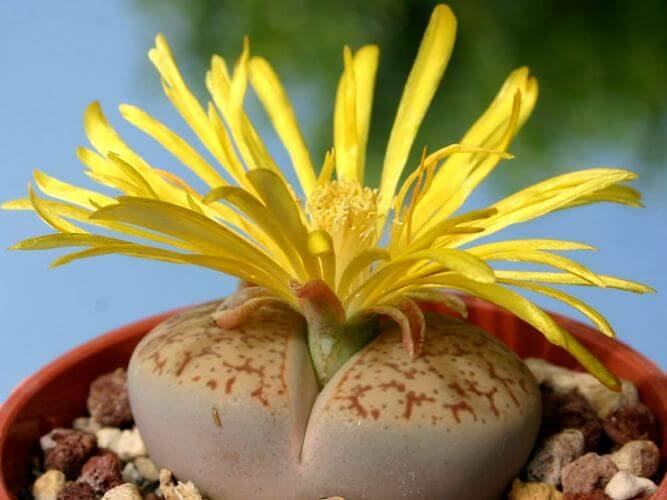 Synonyms: Lithops pseudotruncatella var. pseudotruncatella, Mesembryanthemum pseudotruncatellum, Mesembryanthemum truncatellum. Common Names: Truncate living stone. It thrives best in a very bright and sunny position at all times. Keep the plant at least three to four hours a day. Care should be taken about exposing them to the full blast of the sun rays in summer. Such tiny plants can easily get scorched or broiled and their appearance spoiled. These plants don’t like cold drafts. 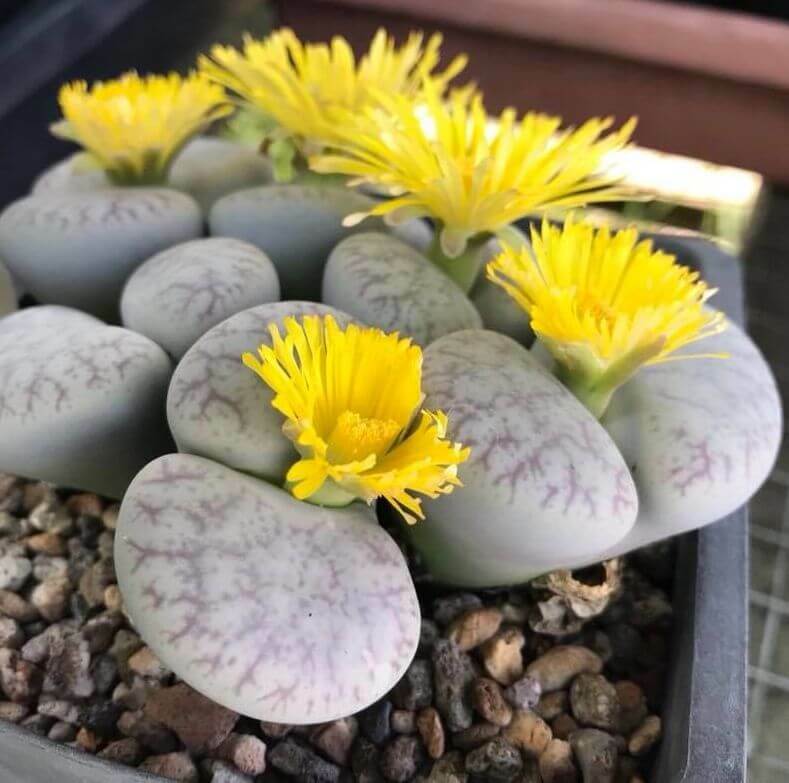 Lithops grows best in well-drained, sandy-gritty soil or use a potting mix available for cacti and succulents with an addition of 20% more sand or perlite. You can put small pebbles or gravel to get an additional decorative effect. Water sparingly from late spring until the flower dies in the autumn, giving just enough to make the potting mixture barely moist and let the top two-thirds of the mixture dry out between watering. From autumn to spring these plants have a rest period, during which new leaves replace the old ones. During the rest period, the water in the old leaves supplies the needs of the new leaves, give plants no more water until the following season. Begin watering after the old leaves completely dry. It thrives best in 65°F – 75°F. It can endure temperatures down to freezing, but should not generally be subjected to temperatures below 10°C / 50°F. It is not important to feed these plants at any time. Fertilizing it weakens its tissues and makes it susceptible to rot. It can be easily propagated by seed or cuttings. Cuttings can only be used to produce new plants after a plant has naturally divided to form multiple heads, so most propagation is by seed, but the seedling usually takes several years to reach blossoming size. There is no serious pest or disease problems. Watch for red spiders, sciara flies, and Mealybugs.